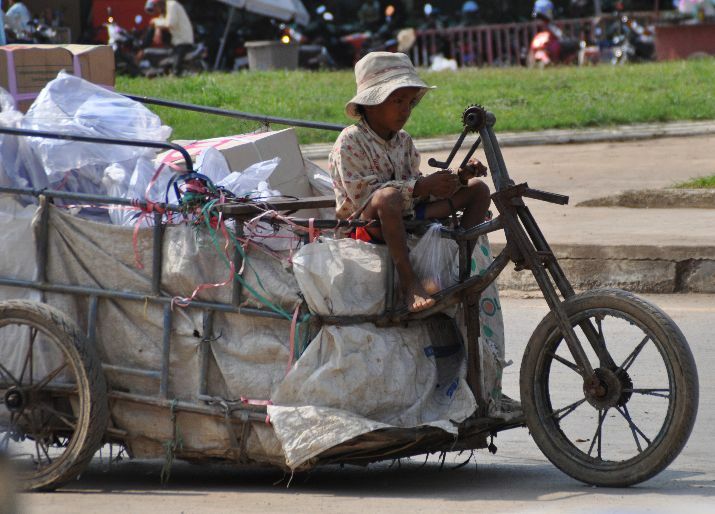 In Poipet, Cambodia the Thai officials don’t let the Cambodian’s use vehicles to transport good across the border, so they build their own push-carts. This push cart is being steered by a young boy carrying goods across the border. He can either pedal or steer with his hand controls. Oddly enough, he is under a UN-ILO (International Labor Organization) sign which says, “Eliminating the worst forms of child labor by 2016”. Looks like he has a few more years to work!